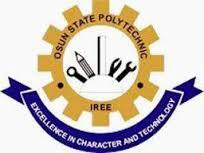 Osun State Polytechnic Iree [OSPOLY] Daily Part-Time (DPT) Admission Form, Courses, Admission Requirements, Application Guidelines, Deadline / Closing Date for 2018/2019 Academic Session. Latest Update: Osun State Poly Iree DPT Admission List 2018/2019. Available Programmes & Specific Entry Requirements. Completed application forms including photocopy of claimed credentials should be submitted not later than six weeks of the publication to: THE DIRECTORATE OFFICER, Directorate of Part –Time Programmes, KOKO Village, Osun State Polytechnic, Iree. Sales of admission form closes 21st January, 2018.